Pei Wei, the Pan-Asian fast casual restaurant, is breaking new ground in menu innovation with the launch of their latest concept Pei Wei Test Kitchen. This new restaurant is located near their company headquarters in Scottsdale. The open-to-the-public restaurant offers a glimpse into the brand’s future. At this new location only, participating guests can provide input on more than 30 new and refined dishes being tested for possible national roll out as part of the company’s 2017 re-brand. 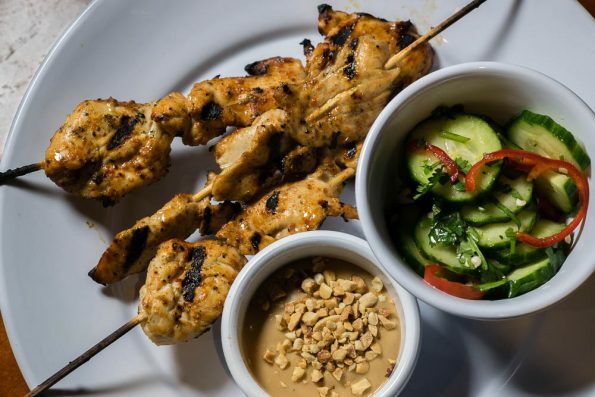 Chicken Satay Skewers (Char-grilled chicken seasoned with Thai spices and served with peanut sauce and spicy cucumber salad)– These were a great starter! We really enjoyed them, especially the peanut sauce which had hints of coconut flavor. 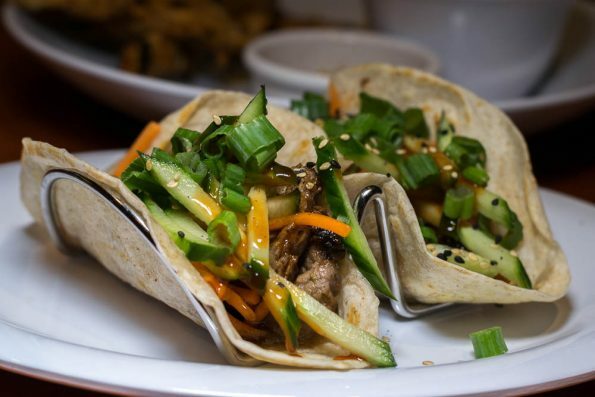 Asian Street Tacos (Korean BBQ- Char-grilled steak, Korean BBQ sauce, cucumber, pickled carrot, and spicy mayo with scallions and sesame seeds)– We enjoyed these tacos a lot. The Korean BBQ sauce was fantastic. These are a great way to change up your Taco Tuesday routine. Sesame Broccoli (Wok-tossed broccoli with sesame ginger sauce, topped with toasted sesame seeds)– If you are looking for a way to enjoy a typically under appreciated vegetable, this is it! 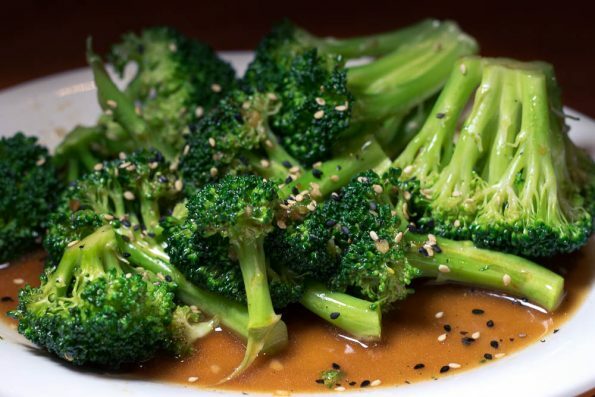 The sesame ginger sauce is delicious and the broccoli is cooked perfectly. 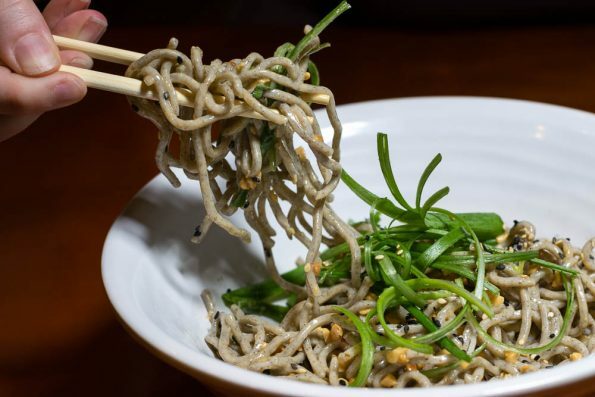 Chilled Sesame Soba (Chilled sesame soba noodles tossed with sesame peanut sauce, and garnished with crispy onions, chopped peanuts, sesame seeds, and scallions)- Perfect for warmer weather, the Chilled Sesame Soba has amazing potential to be a summer favorite. The flavors are full bodied while the noodles are surprisingly light. 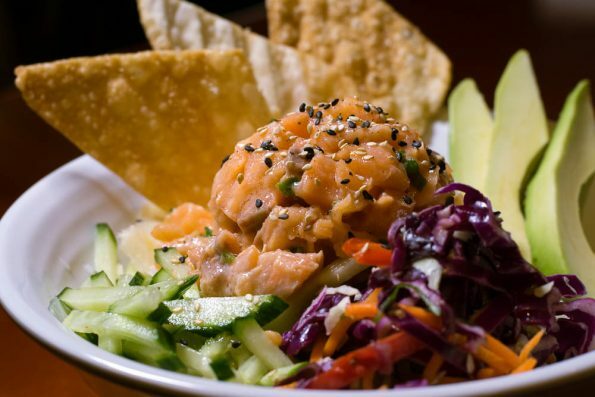 Salmon Avocado Poke Bowl (Spicy salmon, cucumbers, avocado, Asian slaw, pickled ginger, toasted sesame seeds, and crispy wontons, served on sushi rice)– With poke being such a hot thing currently in the food world, it would not surprise us to see this on future Pei Wei menus. The sushi rice was a nice change from the typical sticky rice. 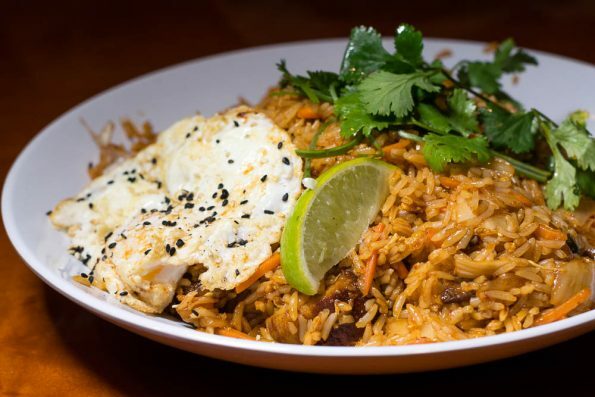 Kimchi Fried Rice (Marinated kimchi and pork belly, served with a fresh cracked egg, ginger, garlic, carrots, tossed with a spicy Korean sauce, and garnished with a fried egg, sesame seeds, scallions, cilantro, and a lime wedge)– This was by far our favorite dish of the evening. Everything about the fried rice was perfection. There was so much flavor between the umami of the sauce and the tanginess of the kimchi. *The Geeks were given comped items to facilitate this write-up; Information about the menu items and concept was provided to us, opinions are wholly our own. View our Disclosure Policy for more info. My name is Daniel and I am writing on behalf of Bronx Hot Sauce. Bronx Hot Sauce is made with serrano peppers grown in over 40 community gardens throughout the Bronx. We fund and support these gardens and growers by sourcing our serrano peppers at premium prices. We donate the pepper seedlings at the beginning of each growing season. We buy back the pepper yields from the gardens throughout the year. This unique buy-back model allows each garden to defray their maintenance cost and Bronx gardeners to earn additional income. Bronx Hot Sauce is unique because it is currently the only commercial product in the United States produced from community gardens. We cook our small batch artisanal hot sauce, using only six all-natural ingredients to ensure fresh and delicious flavor.